What’s crazy is the amount of detail in Jessup’s roughly 100-square-foot, floor-to-ceiling composition, which boasts 15 shades of blue glass in the trees alone. 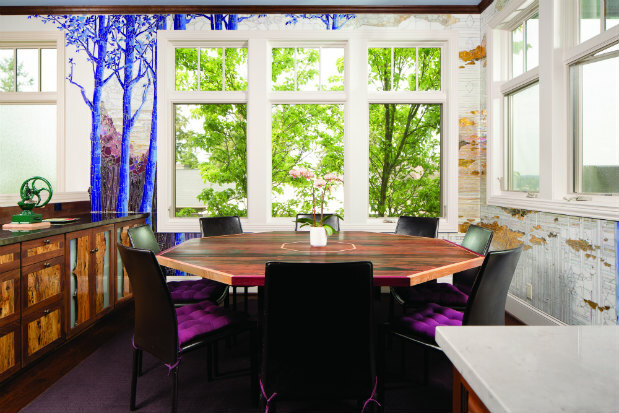 Hand-cutting each piece of stained glass, Jessup carefully crafted the Mediterranean-inspired landscape as an extension of the natural environment outside the dining room windows. The lower edges of the windows match the exterior horizon line outside, with the mosaic culminating in what Jessup refers to as a “Rorschach sunrise” in the northeast corner of the room.